AAYUSHI KARNIK and Beer Puppets Coming to Town! 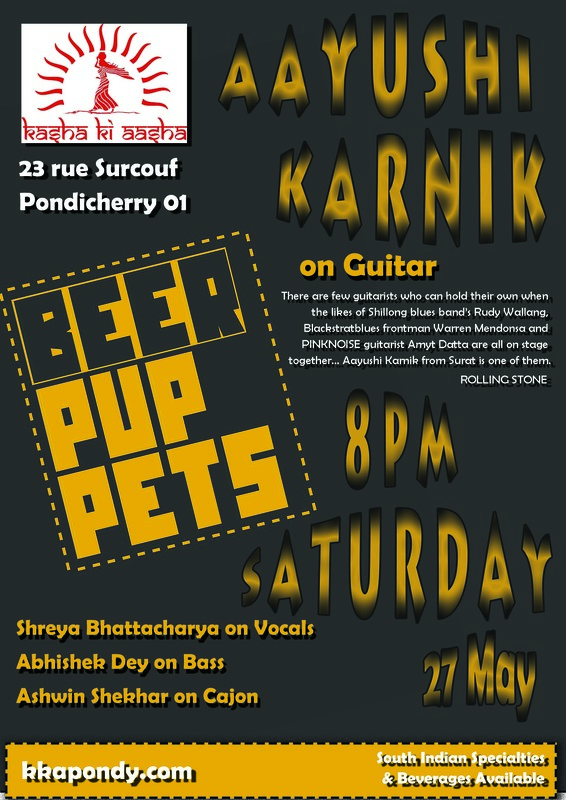 Kasha Ki Aasha is thrilled to welcome acclaimed guitarist, Ayushi Karnik to Pondicherry along with the popular band BEER PUPPETS this Saturday evening at 8 pm. One show only! Aayushi Karnik is a 22 year old Guitarist and Singer Songwriter from Surat, Gujarat. She began playing at age 12 and performed first as a duo, “Zephyr” with Hardik Desai. Exposure to the music of Chuck Berry and Shilong based band, Soulmate, led her into the Blues. Despite the lack of a Blues scene in her home state, she eventually started the band, “Red Blues.” Aayushi recently completed her architectural degree but is now pursuing a musical career full time. Beer Puppets includes Shreya Bhattacharya on Vocals, Avishek Dey on Bass and Srinjay Banerjee on guitar mainly based from Calcutta and alumnis of Swarnabhoomi Academy of Music, Chennai. The band experiments with rich harmonies and often collaborates with established national and international artists. Recent collaborations include performances with New York Based Jazz artists Carolina Calvache on Piano and Karina Colis on Drums. See you this Saturday at 8 pm at Kasha Ki Aasha!